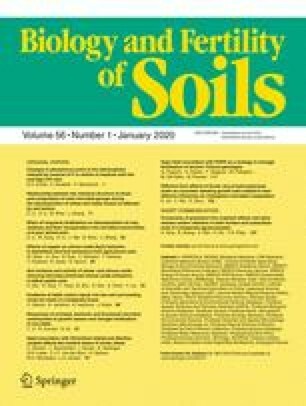 In this study we examined the effect on soil fungal:bacterial biomass ratios of withholding fertiliser, lime, and sheep-grazing from reseeded upland grassland. The cessation of fertiliser applications on limed and grazed grassland resulted in a reduction in soil pH from 5.4 to 5.1. The cessation of fertiliser applications and liming on grazed grassland resulted in a fall in pH from 5.4 to 4.7, whereas withholding fertiliser and lime and the removal of grazing resulted in a further reduction to pH 4.5. Substrate-induced respiration was reduced in the unfertilised grazed (21%; P<0.01) and unfertilised ungrazed (36%; P<0.001) treatments. Bacterial substrate-induced respiration and bacterial fatty acids were unaffected by the treatments. The relative abundance of the fungal fatty acid 18:2ω6 increased by 39 and 72% (P<0.05) in the limed grazed and unfertilised grazed treatments, respectively. Fungal substrate-induced respiration increased in the limed grazed (18%) and unfertilised grazed (65%; P<0.05) treatments. The ratio of 18:2ω6: bacterial fatty acids was correlated with the ratio of fungal:bacterial substrate-induced respiration (r=0.69; P<0.001).